An open letter to 47 Republican senators from Iran’s hard-liners: We have so much in common. You have opened our eyes. We are brothers. 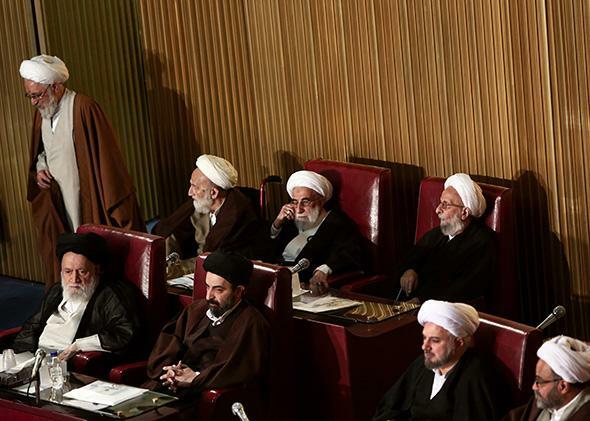 Members of Iran’s Assembly of Experts, Mohammad Taghi Mesbah-Yazdi (upper right) and head of the Council of Guardians, Ahmad Jannati (upper center), attend a session to appoint a new chairman on March 10, 2015, in Tehran. Thank you for your letter of March 9 explaining your system of government. We were unfamiliar with the complexity of your laws. For three years we have been negotiating a nuclear energy agreement with your president. We now realize our mistake. As your letter makes clear, the authority to establish such agreements on behalf of your country rests with your Congress. We are in your debt for this clarification. Moreover, your letter has prompted us to undertake a broader study of the American political system. What we have learned has opened our eyes. For 35 years, we have treated you as an adversary. Our intelligence agencies told us that your culture and your political system were radically different from ours. We now understand that we were misled. Your country is much like ours. Indeed, your Republican Congress is much like our revolutionary Islamic councils. We are brothers. We were delighted to read this sentence. What you have described—a circle of overseers who work in perpetuity to restrain the president—is very familiar to us. Our president, like yours, is limited to two consecutive four-year terms. His powers are also severely circumscribed. He has a national security council, but he and his council do not establish our nation’s policies. In our system, true power lies with the chamber that oversees the president. For you, this chamber is the Senate, controlled by your Republican caucus. For us, it is the Council of Guardians. Members of our council, like members of your Senate, serve six-year terms. The council may veto any legislation, which, in its judgment, violates our republic’s guiding body of law. For us, that body of law is Sharia. Our intelligence agencies told us that in your country, the guiding document is your Constitution. Recently, however, we watched videos from your “Conservative Political Action Conference.” Several of your senators spoke there about the abomination of homosexual marriage and the importance of protecting religion. Our assessment is that your senators interpret your Constitution in accordance with the Christian Bible, just as our council applies our Constitution in the light of the Holy Quran. We particularly enjoyed the speech of your senator from Texas, Ted Cruz, who called on your government to fight for Christians abroad. This is in agreement with our own policy of coming to the aid of faithful Muslims everywhere. We are in great admiration of Sen. Cruz. In our republic, he would be an Ayatollah Uzma. We appreciate his signature on your letter and his steadfastness in correcting your president. Many of us were dismayed to learn that Sen. Cruz was criticized in your country for withholding the government’s operating funds in order to block the implementation of a health care law. Some Americans even called the senator a hostage taker. We also very much admire the principal author of your letter, Sen. Tom Cotton of Arkansas. Sen. Cotton, like many of our young militiamen, served in combat in Iraq and believes that he is an instrument of God. Some may consider him too young to assert dominion over your country’s foreign policy, at 37 years of age and with only two years of political experience. But we in Iran appreciate his vigor. He reminds us of the young men who seized your embassy here in 1979, two years after he was born. Those brave young revolutionaries did not wait for guidance from their elders. In Iran, all educational institutions are governed by our Cultural Revolution Council, which safeguards the faith of the people. We have been unable to locate such a council in your federal government. However, we recently learned that the state board of education in Sen. Cruz’s state, Texas, controls through its purchasing power the content of textbooks throughout your country. The board has used this power to limit the teaching of evolution and promote the celebration of your country as a Christian nation. Our cultural council protects Islam in the same way. Our system, like yours, has its critics. Some portray our Council of Guardians as unelected ideologues who override the will of the people. The charge is absurd, as your own experience demonstrates. In your country’s three most recent elections, which together produced your Senate’s entire current membership, the other party’s nominees won 5 million more votes than yours did. Nevertheless, you control the chamber. The true will of the people, as you know, is to follow those of us who understand what is best. Thank you once again for this enlightening exchange. Prompted by your letter, our council has decided to end the talks with your secretary of state and dismiss nuclear inspectors from our country. We look forward to working with you in the future on other matters of common interest, such as prayer, capital punishment, and troops in Iraq.